Villa Katerina is up on a beautiful hill just across the lively resorts of Chersonissos, Stalis and Malia, on the north coast of the magnificent Mediterranean island of Crete. Villa's living space is 150 M2, two stories with three bedrooms with skylight view and can accommodate as much as six persons. Ground floor, one WC decorated with marble floors and walls. First floor, one big main bathroom decorated with marble floors and walls includes a bathtub and have mountain view. The indoor full furnished areas are elegantly decorated and painted with warm colours. Marble and wooden floors combined with the fireplace are creating an inviting atmosphere. Outside there is a traditional BBQ and dining area which is located next to your private pool, with comfortable chaise lounges to rest and sunbathe under the brilliant and warm Cretan sun during the days or to gaze the stars along the breezing air form the mountains. Loved the villa, had a wonderful time, beautiful property and very comfortable beds. George and katerina picked us up from the airport and they had kindly filled our fridge with everything we needed. Only thing was we could not connect to wifi even though we phoned George, but still no joy. Could not get any English speaking channels on tv even though there were about 2000 channels !! Would certainly stay again. This Villa definitely has all you would need for a great holiday in this area.It is welll situated within walking distance of the beach and bars and restaurants of Stalis. After staying in the villa for a week I can report that we had a great time and George the owner was very helpful throughout the week. The Villa is located in Stalis which seems to be very well suited for families or small groups looking fro a quiet break. However it is also well situated for young groups who are looking to go to Malia or Hersonissos. We got a taxi to Malia Every night which varied from 8-10 euros, We also walked it a few times but I wouldn't recommend that option after a night in malia. We had a great time in this villa and id like to thank George again for his help. Id suggest booking this while its available, don't miss out! The villa was spotless and very modern. George the owner was very helpful and even picked us up from the airport as we had a very late arrival. The villa has all the space and amenities that you will need. Like the previous review I would advise to take DVDs as you have one British channel and that's BBC World, luckily I took some. Although the outside was really nice the pool was quite small but adequate for children. The Greek food was amazing you have to try some. If I was to go Stalis again I would definitely book George's villa. Had a great holiday staying in this villa. It was lovely and clean with all you could possible want catered for.Loads of clean towels and beach towels so dont need to pack so much.A little walk to nearest shops but that was nice as you were away from the nightlife at night.A lovely kitchen if you want to cook! Lovely big bedrooms and air con if you need it. huge tv and dvd player so bring some films.Pool small but spotlessly clean lovely for cooling down. George the owner very helpful if you need anything. Would definatly use again if go back to stalis. Stalis is on the North east coast of the beautiful Mediterranean island of Crete between the famous tourist resorts of Malia and Hersonissos. It is 30 Km from the main city of Crete, Heraklion and it's international airport and the amazing archaeological site of Knossos. The town of Stalis is situated on the beach and it's full of hotels, bars and restaurants and many shops that you can find everything you wish. 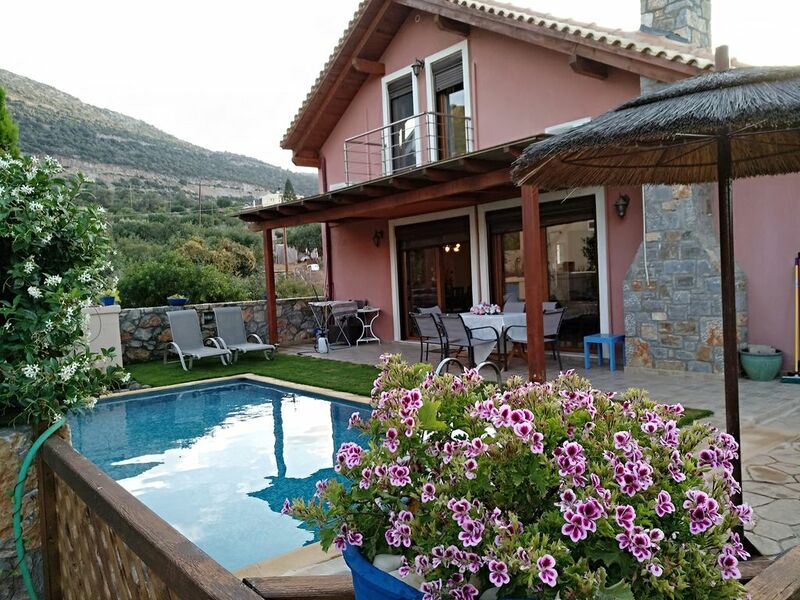 Stalis is an excellent base for your holiday to explore Crete being close to the mountains and the beaches and all the very interesting sites this beautiful island has to offer to it's guests. Golf: The Crete Golf Club is a championship course, the only 18-hole golf course on the island of Crete and one of the most impressive courses of the Mediterranean, which holds a unique challenge and a pleasant experience for both golf players and visitors all year round.